In the final scenes of the Roseanne revival’s first season, the Conner house floods. A massive rainstorm hits much of Illinois, and in the midst of a family crisis about how to pay for Roseanne’s knee surgery and whether Dan should hire undocumented workers, they realize their house has sustained thousands of dollars of water damage. Dan wades through the knee-deep water, trying to convince Roseanne that everything will be okay — trying and failing, that is, because they both know there’s no way out. He sends her upstairs to reassure the rest of the family, and they give each other a look that says they both know it’s a lie. There will be no money for Roseanne’s knee. Dan has ruined his friendship with his long-time union partner, and simultaneously given up on his principles, all to maintain an already disastrous status quo. It’s exactly the kind of painful, inescapable hole Roseanne described in the beginning of the season when she explained to her sister Jackie why she voted for Donald Trump. Things were really, really bad, and Trump promised to make things better. “He talked about jobs!” Roseanne says. And he did it in a way that resonated with Roseanne’s beliefs about government, budgeting, and handouts. She mocked Jackie for supporting the Affordable Care Act, which she implied was a terrible idea because the government could never pay for it. “You’re a good-hearted person who can’t do simple math,” she told Jackie. 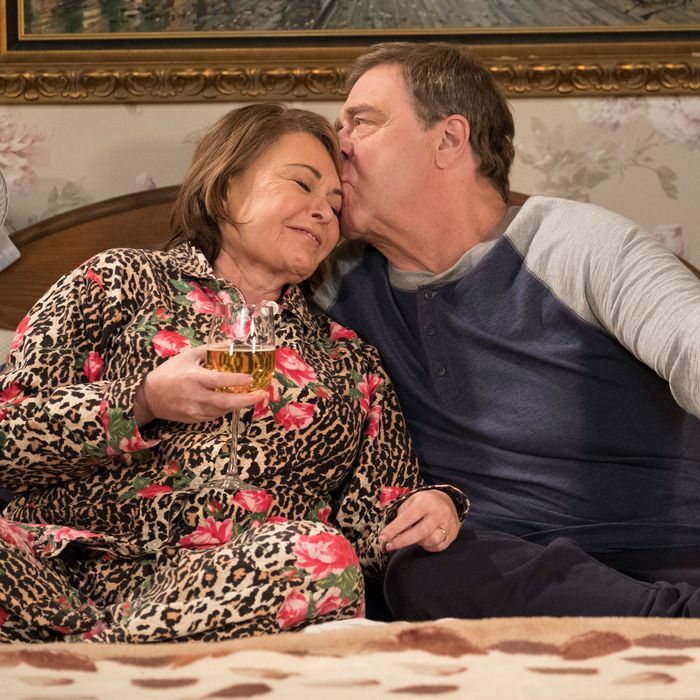 For a moment in the finale, it seems as though the Roseanne will swerve into the skid, shifting gears from its frustratingly shallow approach to politics and finally connect Roseanne’s political jibes with some meaningful real-world implications. Yes, the setup for the Conner’s rock-and-a-hard-place catastrophe is concerning: It’s presented as Dan’s choice between sticking with his union partner and not having money for Roseanne’s surgery, or hiring undocumented workers so he can get Roseanne’s knee fixed. The not-so-buried implication is that the existence of illegal immigration makes things worse for the Conners. But the decision Dan is poised to make still has the potential to be frustrating and tragic in an illuminating way. He’s betraying his ideals and giving into economic pressure to hire cheaper labor so he can save his family. It could be a story about sadness and sacrifice, and the very hard, inescapable choices families have to make to survive. Instead, the widespread flooding across the state pushes Roseanne’s imagined President Trump to declare a federal emergency. Roseanne and the Conners immediately start celebrating because this means they’ll get “FEMA money.” Dan tells them that he’ll be able to fix up the basement himself with the government funds, meaning it’ll cost them less, and they can use the remainder to pay for Roseanne’s knee surgery. Their problems are solved, and the season ends with everyone joyously gathered around the dinner table. The Conners get an unlikely fairy-tale ending. This is as ridiculous as it is infuriating, and it’s disingenuous to boot. All season long, Roseanne has deliberately poked and prodded at some of the most tender, aching spots in the American cultural psyche. The show has danced past or lingered over topics including health care, opioids, immigration and assimilation, resentfulness, cycles of poverty, jokes about lost dreams and jokes about being in chronic pain. The message Roseanne and Dan have said aloud, explicitly, and in every episode, is clear: Things are bad, their world is unsustainable, and they’re not sure how they’ll make it. In the penultimate episode, “Netflix & Pill,” we learn that Roseanne is addicted to opioids, and in the closing moments she locates a secret stash of pills she’s keeping hidden from her husband. The message of the show could have been – should have been – that these problems are real and they’re not going to go away with the wave of a wand. Except their problems do go away! The hidden pills Roseanne pulls out in the previous episode don’t appear again; apparently, she kicked that addiction with ease. The Conners are saved by the flood that seemed to be their destruction, and then their financial woes dissolve immediately. It is the most heavy-handed deus ex machina imaginable, a literal diluvial deliverance, a get-out-of-debt-free card, an all-consuming act of God that the writers handily pass off to a benevolent fictional Trump so he can save the day. The show’s wafer-thin veneer of political content is still in evidence, as Darlene asks whether Trump’s state-of-emergency declaration is valid even if he misspells Illinois. But that gentle little dig is eclipsed by the overwhelming demonstration of Roseanne’s most cowardly impulse: to raise the specter of American desperation and then cleanly cover it all with a sudden rush of water. You could see the flood as absolution, I suppose. It could be a fresh start. To me, it looks more like a convenient way to hide some bodies. The trials and tribulations of the Conner family have been touted as representative of a “real” America, as one of the few stories to give us a picture of the forgotten white working class. But again and again, the show refuses to connect any of Roseanne Conner’s cracks about Trump or fake news with the real ramifications of her positions. She believes that the government shouldn’t pay for people’s health care, but she’s thrilled to take FEMA assistance when their house floods. Her knee surgery will still be paid for with federal money, but because they’re getting the money after a flood rather than the basic need for health care, it’s acceptable. Earlier in the season, we were supposed to smile Roseanne as opened her heart to the new neighbors, a Muslim family that she initially assumed had purchased fertilizer to make bombs rather than to fertilize their lawn. But we’re not supposed to draw any through line between that grudging tolerance and the MAGA hat she keeps hanging in her laundry room. With the end of the revival’s first season and the early glimmers of what fall TV will bring, ABC Entertainment president Channing Dungey has suggested that new episodes of Roseanne will now lean less on the politics, and instead will stick more to stories about “family trials and tribulations.” This looks like a way to emphasize universality, but it’s also precisely the problem with this entire season: It rejected the idea that there is a meaningful connection between politics and the family, and instead posited that you can draw a line between stories about a down-and-out working-class family without affordable health care and sufficient employment — that they are either about the family, or they are about politics. That line of thinking suggests that if Roseanne just stops joking about Hillary Clinton, the show will no longer be about politics in America. That if the Conners just hang in there long enough, their house will flood and they’ll be rescued by a potent, metastable mixture of Trump, God, and aid from the federal government — and somehow it won’t be about politics. If the best future Roseanne can offer for working-class families is to wait around for a flood, then it’s not actually a show about an underrepresented reality in America. It’s a fairy tale masquerading as gritty realism. At their very best, fairy tales use fantasy to elucidate buried truths of the human condition — mermaids demonstrate the pain of transformation, and witches are a tangible embodiment of threat — and they use unbelievable plots to illuminate the unseen darkness and beauty of human existence. But Roseanne’s season-ending fairy tale, its final gesture of improbable wish-granting, is not illuminating. It’s a way for the show to hide.